Poet Laureate Andrew Motion talks to Kit Wright. THERE were more poets to the square foot at a gathering on Tuesday than I have ever seen before. It wasn’t a convention of poets or any sort of literary event. But a coming together of poets and friends to pay homage to a man considered to have been Britain’s greatest poet – John Heath-Stubbs who died aged 88 on Boxing Day. And at St Matthews Church in Bayswater, a congregation – many of them poets – filled the pews to hear of things that can only emerge at a funeral. One of the poet’s longest surviving friends, former professor of poetry at Oxford University, John Jones, recalled how he met TS Elliot in 1944 after he had given a talk on Horace describing him as a “gentleman farmer”. Jones didn’t describe how forbidding Eliot appeared, but later when he told John Heath- Stubbs of his encounter with the great man, he rattled off the first line of a well-known piece of self-parody by Eliot – “How unpleasant to meet Mr Eliot”. John Heath-Stubbs hated being described as ‘learned’ said Jones, though he received the Queen’s Medal for Poetry and later an OBE for services to literature. Those among the mourners who may have formed the wrong ideas about John Heath-Stubbs from recent obituaries, were put straight by another friend of his, Bernard Saint. No, the blind poet didn’t live in a basement flat, with bits of food sticking to the walls, nor was John Heath-Stubbs, known as gay man, one who indulged in “pick-ups”. Later, at the reception, a friend of the poet, confirmed that the poet regarded homosexuality as a “sin” though he was gay, and added that he had had three long-term relationships in his life. His mind simply overflowed with learning with constant references to the mythologies of Greece and Rome, while his great epic Artorius has established him one of our great poets, according to the writer AN Wilson in the Daily Telegraph on Monday. But none of this stopped him from enjoying the simple delights of cooking or punk rock. McKie, a Westminster Labour councillor, who helped to care for him in the last years of his life. Typically for the learned poet, the service began with an early 15th-century Italian hymn. 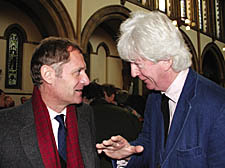 Among the mourners were John Rety who runs the publishers Hearing Eye, based in Kentish Town, poet Dinah Livingstone who lives in Camden Town, Kit Wright, whose poems are part of the Poems on the Underground series, and Poet Laureate Andrew Motion. “Stubbs was the elder statesman of poetry when I was growing up – he was great company, too,” Motion told me. I DON’T know whether Britain’s chief medical officer Sir Liam Donaldson was upset by my column last week – or he is simply angry with the way doctors mocked him on an internet message board. Readers may recall that last week I reported how raw, unprintable messages had been put on the net by a group of junior doctors who felt threatened by unemployment and were blaming Donaldson. The messages were posted on December 24. But Donaldson (pictured) didn’t react until Monday suggesting his attention had been drawn to the meaty messages by his minions who had spotted them for the first time in my column. Writing to the editor of the board Dr Chua, Donaldson’s chief press officer Ricki Ostrov said he had been “alerted to an offensive message regarding Sir Liam Donaldson”. He added that the use of Donaldson’s photograph on the net was a “copyright infringement and should be removed as soon as possible”. But the doctors are unrelenting. In a follow-up message, sent three hours after Ostrov’s headed ‘I found it funny! Did you?’, Dr. Graham Hay-Smith, secretary of a newly formed pressure group, Society of Opthalmologists, accused him of being “out of touch with the coalface”. He accused Donaldson of responsibility for “daft plans” that have “become a farce”. In sorrow, he points out that a new transitional recruitment scheme, aimed to start in 2009, is coming into effect in the next few weeks. Donaldson’s “ill thought-through revolution has opened a Pandora’s box... it is over-ripe for satire”. Hay-Smith, a scholarly type, then quotes Chaucer from the Canterbury Tales that “a man may seye full sooth in game and pley”. He points out that Chaucer knew “humour could be savage and true”. WAS the businessman Gerry Robinson told by the Royal Free Hospital, in Hampstead, to go away and mind his own business – or did he think the hospital wasn’t typical enough for this week’s BBC programme, Can Gerry Robinson Fix the NHS? I only ask because we know that before he settled on a Rotherham hospital for his series, he had visited ten other hospitals, including the Free. Now, this is where it gets murky. According to a disclosure by the Royal Free this week, Robinson (pictured) had researchers working at the hospital for three months last year. Their arrival practically coincided with the arrival of a new chief executive, Andrew Way. By the time the researchers were ready to start filming, they saw the changes the board and Mr Way were going to introduce, said a Royal Free press officer. This, apparently led to a change of heart by the researchers. “Gerry arrived,” said the press officer, “and it became clear we could not give him the room to manoeuvre he wanted. They did some filming but they decided not to come back because they just did not have the necessary leeway. This sounds as if the Free didn’t want Robinson at the hospital – and made their intentions clear. But one of the show’s producers Paul Rasmussen gave a slightly different picture. He said they had “lots of irons in the fire”, and there was no single reason why they did not choose the Free. They wanted to show a study of how a NHS works in general and felt Rotherham fitted the bill better. “This is not a criticism of the Free,” he said. Was there a spat or wasn’t there? I found Gerry Robinson off-limits for an interview, so a certain mystery hangs over the whole affair.